Fungal proteomics research is growing as a result of the large number of fungal sequenced genomes of well annotated proteins available today. The proteome of any organism is dynamic as proteins differ depending on environmental conditions, unlike genomes which are practically constant for all the cells of an organism. In this chapter we have reviewed the ‘state-of-the-art’ of fungal proteomics, including sample preparation, protein separation and identification. We have given examples of proteomics of entomopathogenic and nematophagous fungi. We have also focused our attention on the proteomic study of Pochonia chlamydosporia carried out to date. In this study, the fungus was grown in chitin or chitosan as the main carbon and nitrogen nutrient sources, and the secretome of the fungus in both conditions analyzed. Proteins were concentrated using TCA/acetone. Two-dimensional, sodium dodecyl sulphate polyacrylamide gel electrophoresis and differential gel electrophoresis separated proteins for size and isolectric point. Some of the proteins overexpressed with chitosan that were identified using MALDI/TOF-TOF and LC-MS, were related with carbohydrate or protein degradation. The recently available complete Pochonia chlamydosporia genome sequence could help with protein identification of fungal secretomes under various conditions. This research was funded by the Spanish Ministry of Economy and Competitiveness Grant AGL 2015-66833. Abdallah, C., Dumas-Gaudot, E., Renaut, J. et al. (2012). Gel-based and gel-free quantitative proteomics approaches at a glance. International Journal of Plant Genomics. ID 494572 doi: 10.1155/2012/494572. 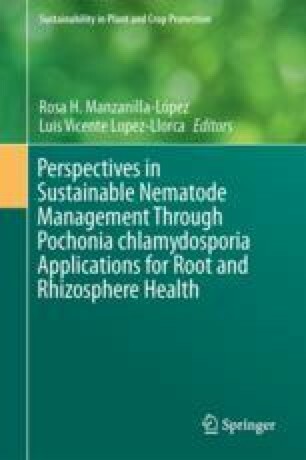 Escudero, N., Ferreira, S. R., Lopez-Moya, F., et al. (2016). Chitosan enhances parasitism of Meloidogyne javanica eggs by the nematophagous fungus Pochonia chlamydosporia. Fungal Biology. doi: 10.1016/j.funbio.2015.12.005. Nordbring-Hertz, B., Jansson, H. B., & Tunlid, A. (2006). Nematophagous fungi. In: eLS. Wiley, Chichester. doi: 10.1002/9780470015902.a0000374.pub3.